Golden Eagle Aviation Company, Blackpool, 1919. Born in 1895, he joined the Durham Light Infantry and passed his flying certificate in a Maurice Farman Biplane at the Military School, Farnborough on May 2nd, 1915. He was awarded the Military Cross in October 1915 for bringing down the first German two seat Albatross aircraft behind British lines. He was twice mentioned in dispatches and promoted to field rank in 1917 at the age of 21 and went on to command 48 squadron. 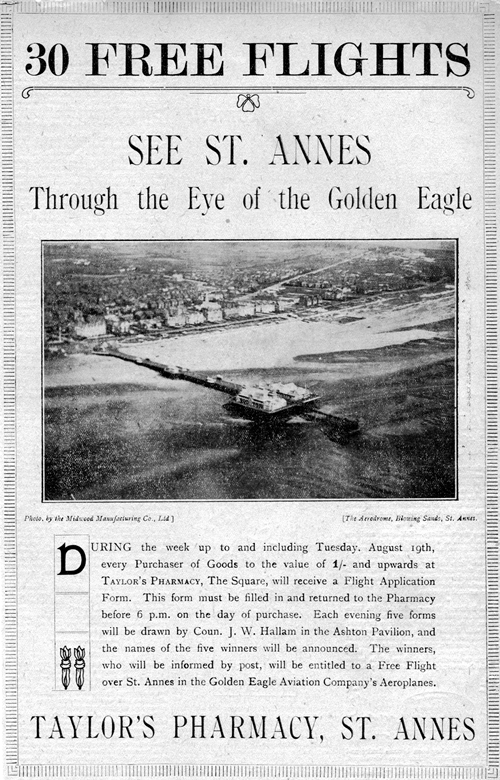 He left the Royal Air Force in August 1919, and formed the Golden Eagle Aviation Company which provided pleasure flights over Blackpool, Lytham & St.Annes. He also offered trips to Southport and flying lessons. 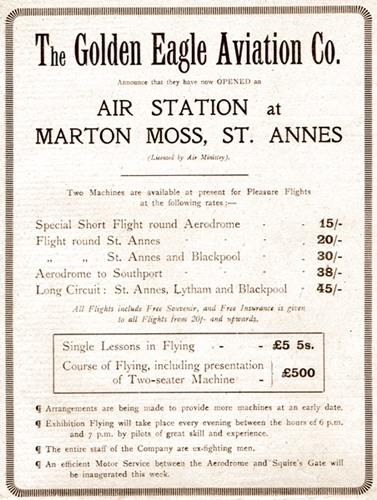 The aerodrome was at Blowing Sands, Marton Moss, Blackpool (possibly a farmers field near the Shovels Inn) and there was a motor service to Squires Gate. The pilots and mechanics were all ex-military, mostly Royal Flying Corps. They had experience in aerial reconnaissance and took many early aerial photographs of the Fylde Coast. Some were printed in the local publications and some as picture postcards. By 1920 he had carried over 3,000 passengers in ex military De Havilland aircraft modified for carrying passengers. GOLDEN EAGLE AVIATION CO., LTD., 438, Corn Exchange, Corporation Street, Manchester.—Capital £5,000, in £1 shares. Aeroplane, hydroplane and airship manufacturers and dealers, etc. Acquiring premises at St. Ann's-on-Sea. Directors : Maj. H. S. Shield, M.C., Lieut. A Pearson and Lieut. W. C. Ellis. ST. ANNES FROM THE AIR. THROUGH THE EYE OF THE GOLDEN EAGLE. Photo, by the Midwood Manufacturing Co., Ltd. (The Aerodrome, Blowing Sands, St. Annes). 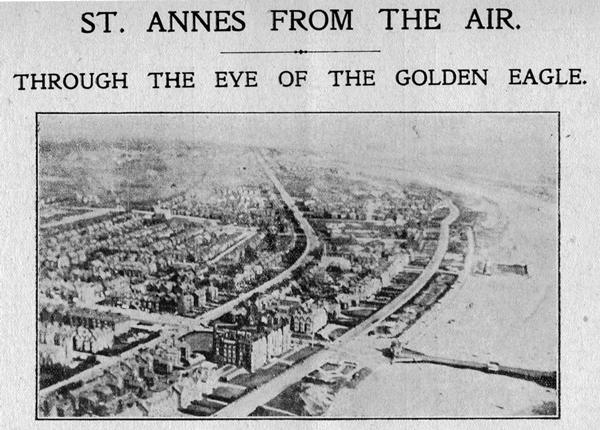 The above photograph, taken from one of the aeroplanes of the Golden Eagle Aviation Co. (whose air station is at Marton Moss, St. Annes), gives an interesting view of St. Annes. The picture was taken from over the sea, and gives a birds' eye view of the town. The result is quite different from the usual pictures taken from the air by machines specially adapted for photography. To secure the photograph the operator knelt on the seat and leaned against the side of the plane to get a clear view for the camera lens. At the time the photograph was taken the machine was flying at an altitude of 800 feet. The most noticeable features of the photograph are the two roads which run parallel, like two broad. white ribbons, for a considerable distance—the Esplanade and Clifton Drive stretching away almost to Lytham. As the photograph was taken from the Northerly side of St. Annes, the short length of St. Annes Road West, with its magnificent width, is partly obscured by the shops on the North side, but Orchard Road and St. Thomas' Road (over the railway bridge) can also be distinguished. This view has been the privilege of the few up to the present, but the advent of the Golden Eagle Company has made it possible for anyone to enjoy the view. For a slight fee a circuit of the district can be made in safety, and a splendid panorama of the Fylde obtained.